I am currently sitting at the end of a long wooden table in a warm but breezy room, drinking my coffee and eating some cereal and looking out over the balcony into Casco Viejo, Panama. I woke up early this morning to write, just because I feel like I have so much to say and not enough time to say it. Our day began yesterday with a group breakfast in the hostel. As usual, I was very thankful for the communal pot of rich black coffee. We piled into the big yellow “Colegial” bus to head out to Portobelo, Colon, the poorest city in all of Panama, where I was shocked by both the beauty and struggle. I found myself asking, “How did these people end up here?” and “How do they ever escape?” and in the back of my mind, I knew that I may never be able to find the answers to these questions. La pobreza is something that doesn’t cross my mind much back in the states. I’m often so consumed with my own life, so impassioned with my own daily struggles, that I fail to look outside of myself. Yesterday, though, I had a re-realization of sorts when it occurred to me that I, my whole soul and being, is the most miniscule speck out of the 7 billion specks that populate this planet. My output of energy makes up a tiny fraction of the world’s output of energy. Normally, this realization would depress me, but yesterday I was able to see the immense power of one. Just one person’s love and energy can be transforming. 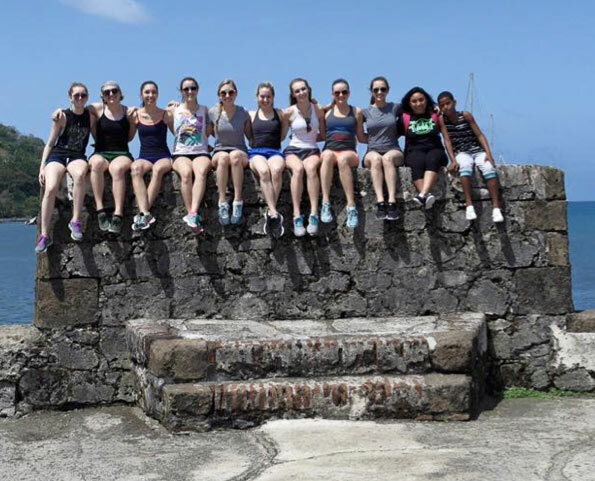 As we meandered through the town, we explored an old prison right on the water, and eventually made our way to La Escuela de Ritma to take a Pasa Pasa dance class. Three long and beautiful African men stood in front of us in a small but impressive studio, and despite our language barrier, we learned their hip-hop style grooves and moves. For me, it felt really good to just dance, to just cut loose and have fun and not give a worry or a care to what anyone thought about how I looked. It was also so interesting to get a taste of what dance is like for people so different from me. It was clear to me that these men take their art form very seriously, despite their lack of resources, especially in comparison with your typical American dance studio, and I was beyond inspired by this. If these men, who live in the poorest town in Panama and have much more on their minds than I’m sure I can even imagine, can pour so much heart and soul and passion into their work, then so can I. We took our sweaty (and I mean sweaty) selves back to the bus for a toasty, bumpy, hour-long ride to Colon, Colon. We unloaded and greeted the children at Aldea SOS orphanage, and they seemed excited to see us as we prepared to teach classes on the grounds outside for two hours. The classes went fairly well, and for me, they were as to be expected. The language barrier made things difficult, and the kids sometimes lacked focus. I had to practice my ability to stay calm within chaos. The most amazing part of the day was just seeing the looks on those kids’ faces, especially the youngsters. Little Daniela, in her pink Tweety Bird dress, smiled at me with such love and joy and excitement, and it occurred to me that our visit was probably the best thing that would happen to her all week long. After a long and sleepy bus ride back, where I had some time to do some more thinking, I began to think about the work of one of my favorite authors and life inspirations, Brene Brown. In her book Rising Strong, a guide to wholehearted living, owning our stories, and opening up to the vulnerability that fuels humanity, she briefly examines the role of the privileged amongst the impoverished. Essentially, she comes to the conclusion that many of the “privileged” or perhaps upper class people of the world have a hard time fully recognizing the scope of the need of the underprivileged because they cannot recognize their own need for help and human connection. She explains that people who are “over-functioners” in life (always the helpers, always the doers, always the perfectionists who attack anxiety with a “do more” attitude) have a difficult time accepting their own need for other humans. At the end of the day, however, we all need love, support, and connection. It is a part of our humanity at the core of our bones. Teaching those kids yesterday stirred up more ideas about this in myself. I had a hard time really recognizing their struggle. In the moment, they just felt like kids taking a dance class, and it was hard for me to think about what their lives would be like after we left, the pain they may go through in their journeys as orphans, unable to be adopted because of the convoluted Panamanian system. I wanted to look away, and I believe that I couldn’t look right into the eyes of their struggle because I cannot look right into the eyes of my own struggle. I have always pushed away the idea that I need help. We ALL need help, and recognizing this shared humanity is a scary thing. Today will be a new day, and today and always, I’d like to set the intention – as simple as it sounds -to remember that I’m a human living among humans.